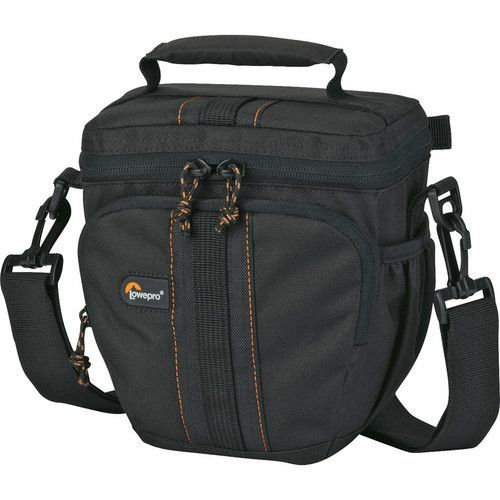 The Lowepro Adventura TLZ 25 Top Loading Bag (Black) is designed to carry and protect a compact digital SLR camera such as; canon Rebel, Nikon D5000 or similar size camera with most 18-55mm f/3.5 lens attached, cords, filters or extra battery, memory card, original camera strap, small accessories or personal items. The bag is made from Water-resistant, 600 denier polyester and 600 denier ripstop nylon with a padded interior that protects the gear. It is lined in a soft, brushed tricot burnt orange color lining that helps protect LCD screen from dust and scratches. There is an OverLap zipper with rain flap lid that safeguards the gear from dust, sand and moisture and covers the zippered closure for extra protection. 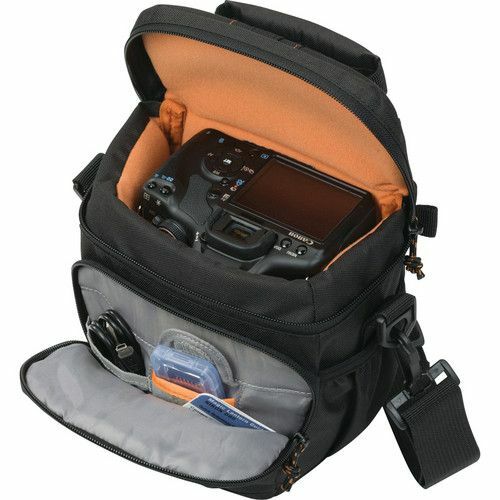 It has a zippered front pocket with covered dedicated memory card pocket inside that holds an extra memory card, plus additional space for filters or small accessories and personal items, It also has 2 stretchy, pleated side pockets that can store and easily grab lens caps, accessories or small personal items. 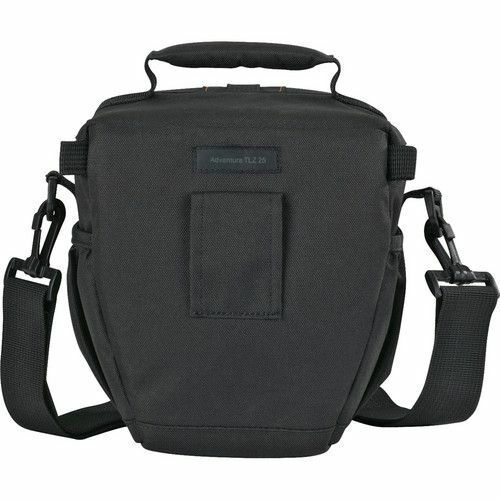 The bag is carried by a padded grab handle, a removable, adjustable shoulder strap with snap hooks and non-slip patch or a built-in belt loop.